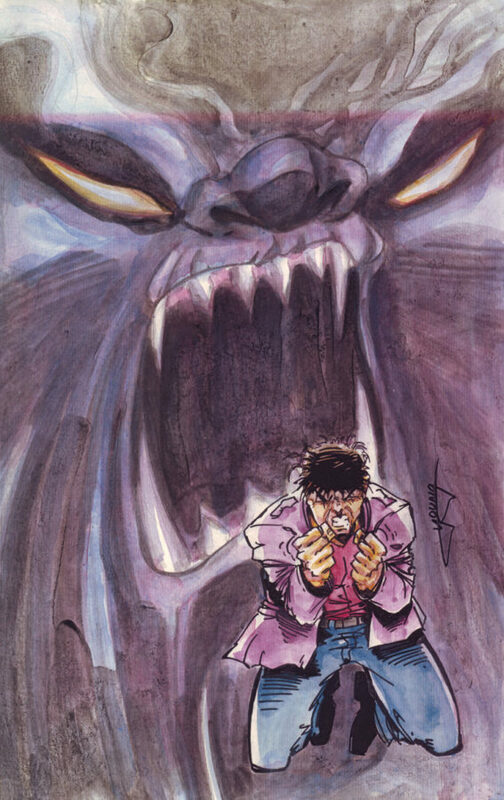 Horror in comics is a stylistic story telling structure that is quite often difficult to master. For those who practice the craft, a love of the medium and a passion for things that go “bump” in the night is a must. Case in point: Vin Varvara and his graphic novel The Howler, the story of a man accused of a crime he didn’t commit, on the run from the law and the beast that lurks within. 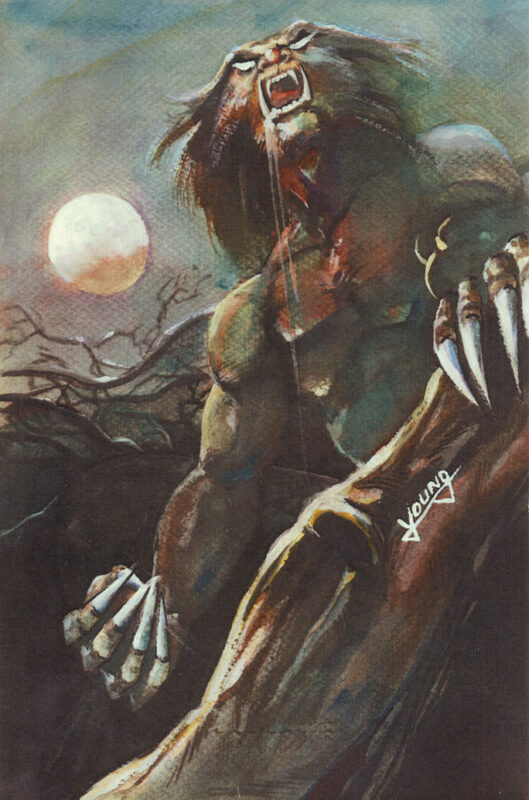 A throwback to classic comic tales from the pages of DC Comics’ Swamp Thing and Marvel Comics’ The Incredible Hulk, The Howler captures the spirit of the late night creature feature from a bygone era. Vin Varvara, writer of the graphic novel The Howler took time out of a busy schedule to share a bit about his career, love of monster mash-ups, comics, and the monster that lurks within The Howler. IM: What is your professional background/training? How did you get into comics? VV: Funny thing about that, I actually never really had any professional training or came from a professional type of background. I never went to art school or took specialized writing classes for comic books. Everything I have done in comics so far just came from a combination of me trying and learning through trial and error. I also take some time to read interviews from other comic creators, and talk to other creators that are just starting out – like myself – about their experiences working in this industry. I got involved in comics when I was very young. I remember my first exposure to superheroes didn’t even come from comics! I used to watch reruns of the old Incredible Hulk TV show with Bill Bixby, the old 60s Batman with Adam West, and the Spider-Man cartoons and his appearances on the Electric Company. It wasn’t until later, when I saw a Spider-Man comic on the old spinner racks of my local grocery store, that I had to have it. Funny thing, looking back on it, that Spider-Man comic didn’t even have Spidey on the cover. It was a menacing shot of the Vulture, of all characters, in these really crazy colors, and menacing pose. For some reason that I just can’t explain, the book just stood out to me. I read through the book a bunch of times that day and I was instantly hooked, wanting to read more and more! Yeah, I was definitely down the rabbit hole at that point. IM: How did Howler come to be? VV: I’ve always chalked up Howler’s creation to one of those stories you hear about where you are working on a different project and you get a welcome unexpected result. Howler’s creation started when I was approached by Jemir Johnson (creator/writer of the Jay Nova series of graphic novels), who had told me he and Matt Wilbekin (creator/artist of Vigilance) were putting together a small press publishing company (that would eventually become Creative Elamentz Studios). I was asked if I wanted to be a part of it. It took me all of about five seconds to think about it and say yes! So, I got down to work on creating a character that I would bring to Creative Elamentz. As I was sitting at the computer, figuring out this one character (who I called Retribution)’s bio, abilities, allies, enemies, etc…, I got to the allies section. I had one of those stray thoughts about how cool would it be if there was a werewolf character in the mix of this story. So, in the Retribution character’s bio pack I had jotted down under allies, literally something along the lines of “something—something—werewolf”. Then it happened. I’ve read stories from other authors about how their characters would just come to life and tell the author their story. Well, this happened to me, once I began to give this werewolf character—that would eventually become the Howler—some thought. As corny as this may sound, this werewolf came off the page and basically guided me in the storytelling. So, Retribution was put off to the side for the time being, and this werewolf got my full attention! After a few feverish hours of sitting at the computer, I became familiar with the story of Chris Stevens, the protagonist of our story, as he is cursed with being a werewolf. Chris, who now has to try to find a cure for his condition while on the run as a wanted fugitive, because the authorities have accused him for the murder of his family. Even with all that drama alone, you have the makings of a powerful story, but then, you add in, while on his journey to find a cure, Chris comes across creatures that are based in the supernatural/ mythology. So now, also added to the story, are old fashioned monster-versus-monster fights. Put all of these elements together and you have the ingredients of a great story! IM: Stylistically, the storytelling in Howler is a bit of a throwback to such titles as Swamp Thing and The Incredible Hulk from the 70s, in that it has a strong horror/creature feature-type vein running through the work. What would you say influenced the tone of Howler? VV: Thanks for noticing the style for The Howler, Mark. That was what I was aiming for. The classic Len Wein and Alan Moore Swamp Thing stories are just great reads, as well as the Hulk comics from the early 80s. Howler’s style was also heavily based in the old Universal Monster movies of the 30s and 40s. I remember watching those movies and just enjoying them. I’m sure they heavily influenced me on a subconscious level when it came to developing the Howler. Looking back and ahead when it comes to the Howler, I’ve always kind of likened the beats of the story to “The Fugitive meets The Wolfman”. IM: What do you think Howler brings to the genre that other horror/hero titles lack? VV: I’d like to think that the Howler is a return to those big fun classic monster-versus-monster fights that you used to see in the older Marvel horror comics, back in the 70s and early 80s, like Ghost Rider, Tomb of Dracula, and of course, Werewolf By Night. But I also would like to think that Howler, in regards to this graphic novel and future stories, will be able to bring old-style suspense and classic horror that readers may have checked out in the older EC comics titles, like Tales from the Crypt. I guess, to really answer your question, Mark, I’d like to think that Howler offers a throwback to old-school horror, while still being grounded with contemporary sensibilities. IM: Did you grow up reading comics? What were some of your favorite titles? Any influences that inspired you to create? VV: Oh, absolutely. I’ve been reading comics since I was eight years old! I remember, when I first started reading comics, I was taken aback by all these different titles that were on the spinner racks of my local grocery stores. (I didn’t come across comic shops until a few years later.) But I always had a few favorites that I had to read every month, like Bill Mantlo’s run on the Incredible Hulk and John Byrne’s run on the Fantastic Four. The one favorite title where I had to have every issue, because I was so hooked by this book—and it had a heavy influence on my creativity—was Chris Claremont’s amazing run on the Uncanny X-Men. Now, I can probably go on and on about Chris Claremont’s run on the X-Men, which would bore your readers. So, all I’m going to say is that as a writer, I truly appreciated what Mr. Claremont did with this group of misunderstood heroes. By injecting personalities and fleshing out each of the X-Men, it got to the point that you, the reader, were fully invested in the X-Men. You found a way to identify with one or all of them, because even though they were fictional characters, it read like real people dealing with real everyday problems (things such as acceptance in a society that doesn’t understand or approve of those that are different). These are problems that are still relevant today. The stories were so rich in these characterizations that you had to keep coming back every month, because you cared. Mr. Claremont made you care about the fates of fictional characters. That is an incredible feat for any writer to accomplish, and it’s something that I aspire to achieve in my writing too. Not only do I want people to read and enjoy the Howler, but I really want them to have the same type of feelings for Chris Stevens and Howler’s struggles, just as I had I felt for the X-Men. I’ll also just want to add that Mr. Claremont showed me that you can indeed write a strong female lead character, and not every female character in comic stories needs to be the damsel in distress. IM: Where did the idea for Howler come from? How did the creative team come together? 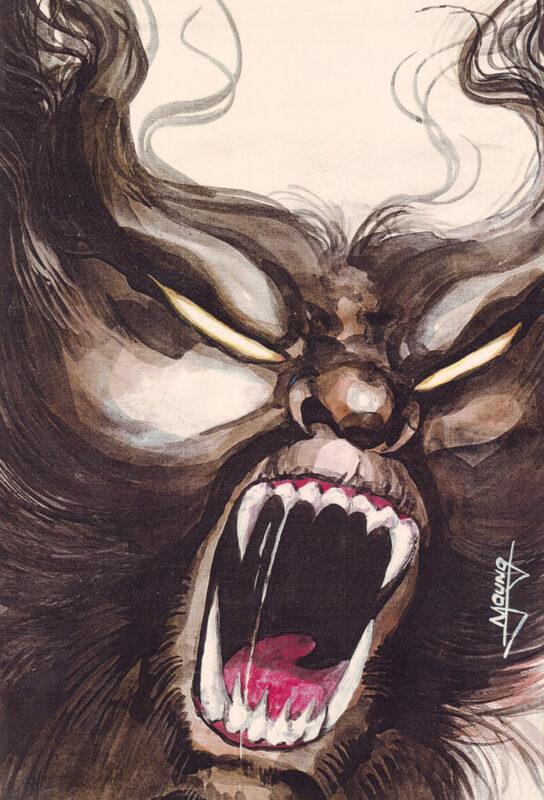 VV: Going back to the creation of the Howler, I always found the myth of werewolves appealing and was captured by their stories, whether it was “The Wolfman,” “Werewolf By Night,” or the first “Howling” movie. I always liked the concept of werewolves and they were part of my subconscious for years. So, again, when I was working on Retribution for Creative Elamentz, I just saw an opportunity to take a shot to explore the werewolf mythos. The creative team came together pretty quickly, if I remember correctly. After I had written a couple of the stories that are featured in the Howler graphic novel, I knew that I had to find an artist to bring these stories to life, because I can’t draw a stick figure to save my life! So, I had put a want ad in the old Comics Buyer’s Guide magazine, and this talented artist by the name of Bill Young had answered my ad and sent me his submission samples. 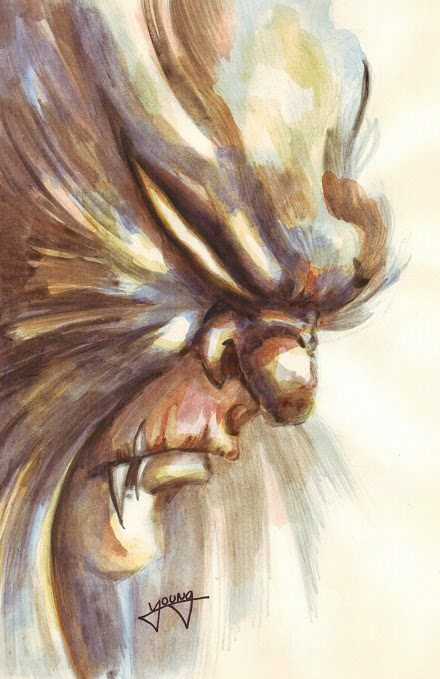 Now, Bill sent a few samples, some superhero, some sci-fi, but the one submission that he included, without any prompting from me, was this incredible painting of a werewolf. How could I not offer Bill the job after seeing that submission piece? After a couple of email exchanges with Bill, he was on board and quickly began working on the stories that I had already written, while also tackling the other Howler stories that I had finished writing, that are part of the Howler graphic novel. IM: With the graphic novel, the reader can clearly see a progression in the art style as the story progresses. Would you say that your storytelling abilities underwent a similar evolution over time, as the project was worked on? If so, in what way would you say your writing changed? VV: Yeah, absolutely. As I was writing the different stories that comprise this Howler graphic novel, I did notice that my writing style changed. I always attributed the change in writing style to me becoming more and more familiar with the characters, and being totally drawn into Howler’s world. IM: When writing, do you tend to work full script or Marvel style? How did this eventually affect the end product of Howler? What challenges did working in that style present to the creative team? How did they overcome them? VV: When I write a story, I always write in full script format and I rarely deviate from that format. When I do get the finished artwork back, I may tweak dialogue for a couple panels, depending on how the artwork in that specific panel is laid out. But yeah, I write full scripts. I just feel more comfortable getting the whole story out at once, beat for beat, as opposed to doing it in a piecemeal fashion. Let me tell you what a talented artist Bill Young is, and what a pleasure it was to collaborate with him on this graphic novel. When I sent Bill the scripts for the Howler stories that would comprise this graphic novel, he just rolled up his sleeves and dove in. There were times where, in the script, I may not have been as descriptive as to I had envisioned how a panel should be, but Bill would nail the panel exactly as I wanted it. It’s like he was a mind reader! All jokes aside, though, what you see in the pages of The Howler is the direct result of stories written in full script format, and drawn by a talented artist, who was able to take my thoughts, bringing them to the comic book page. IM: The graphic novel represents just the beginning of the adventure. Are there plans to pick up the story in another GN, or a series? If so, do you have an idea of when the next installment will be making its debut? VV: As much as I would love to do a Howler monthly comic series, it is not feasible for me at this moment. Perhaps someday, depending on how sales go, and if Howler catches on with the readers (fingers crossed), I could revisit my stance on a monthly series. But right now, I’m happy with having Howler come out in original graphic novels. Besides, I’m sure the readers would like to get the whole story in one book, rather than having to track down multiple monthly issues. But, to get back on track, I’d like to take this opportunity to let you and your readers know that, yes, there is a sequel for the Howler already written. This new story will also be a graphic novel. As for when the new story will be released, I cannot say at the moment. Unfortunately, Bill Young has moved on to other projects and is unable to keep up art duties with the Howler. As much as I will miss collaborating with Bill, I understand his need to move on to other projects and wish him nothing but the best. So, I’m going to take as much time as I need in finding someone who is talented enough to take up the art chores and bring Howler to life. IM: As a writer, would you say that you practice your craft daily? What kinds of habits do you practice to keep you skills sharp and ensure you have a professional work ethic? VV: I do practice my craft in some fashion on an almost daily basis. Whether I’m plotting stories, writing down some stray outlines for stories, working on character bios for new characters, or just writing a script, I’m working on my craft as a writer. I admit, some days, I find it harder than others. On those days, you find you have to work even harder. It’s always easy to write when the ideas are just flowing out of you. Sometimes, the most rewarding ideas are the ones that you have to coax out of you through maximum effort. But, even when I’m not writing stories, I’m always thinking of story plots. IM: Aside from any future plans for Howler, are there any other genres that you would like to explore? VV: Well, I am pretty comfortable within the horror genre and love exploring that world and all the different mythologies that encompass the genre. But it’s also good to step out of your comfort zone. I wouldn’t want to be pigeon-held to one specific genre. I’d like to explore other genres, like the superhero genre, and I’d love to try to create one of those epic sci-fi space operas, similar to Babylon 5 or Battlestar Galactica. IM: For you, what would you say is the most rewarding aspect of working in the comics industry and what would you say is the most challenging? VV: Hands down, the most rewarding aspect of this whole process is watching the step-by-step process of how a passing stray thought takes on a life of its own; going from script to art to finished product. It’s the watching the characters that you have created being brought to life! I don’t think I will ever get tired of watching this process happen. It’s definitely worth all the hard work that is put in to get the graphic novel finished. For me, the most challenging part of working in this industry is the whole marketing, advertising, and trying to get the book noticed. As much work as it took in creating the characters, the stories, and the graphic novel itself, it was fun work. When it comes to actually driving people to the book, I find it to be the hardest part of this process. I hope that this interview is able to direct people to Amazon.com, where they can purchase the Howler, a 165-page graphic novel written by Vin Varvara with art by Bill Young, in either paperback or Kindle formats, for under $10.00! See what I did there? This entry was posted in 82 and tagged Mark Turner, The Howler, Vin Varvara on March 10, 2015 by aipman1.